Tutorial showing how to set up a catch-all Email Account in cPanel so you can see any emails sent to invalid email addresses on your domain. Last updated: Jan 25, 2019. 16:32 UTC. If your friends, family, or business client makes a spelling error when sending you an email, your email client may never receive it. You can, however, configure your account settings to forward those mails to a designated account. What is a Default \ Catch-all Email Address? To give an example; You have the email address sales@yourdomain, and someone sends a mail to admin@yourdomain. Without a the catch-all address, you would never receive it. You can only set up one catch-all mail address per domain. 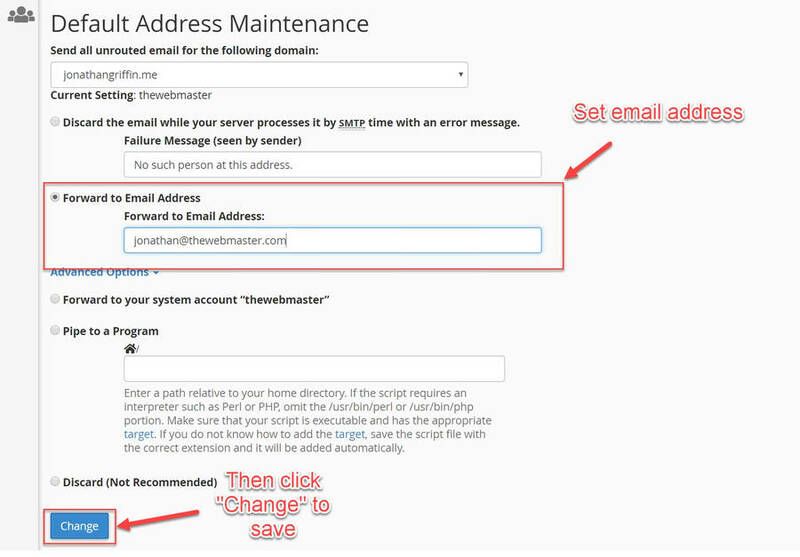 If you wish for those mails to be sent to more people, you can set up email forwarding from the default address. This tutorial assumes that you have already logged into your cPanel and already have created an email address. Click on the Default Address icon in cPanel dashboard. You will find it in the Email section. Click on the 'Default Address' icon © The Webmaster. Under “Send all unrouted email for the following domain:” select your domain from the drop-down box. If you have multiple email addresses configured on a cPanel account, you can configure the catch-all address for each of them. 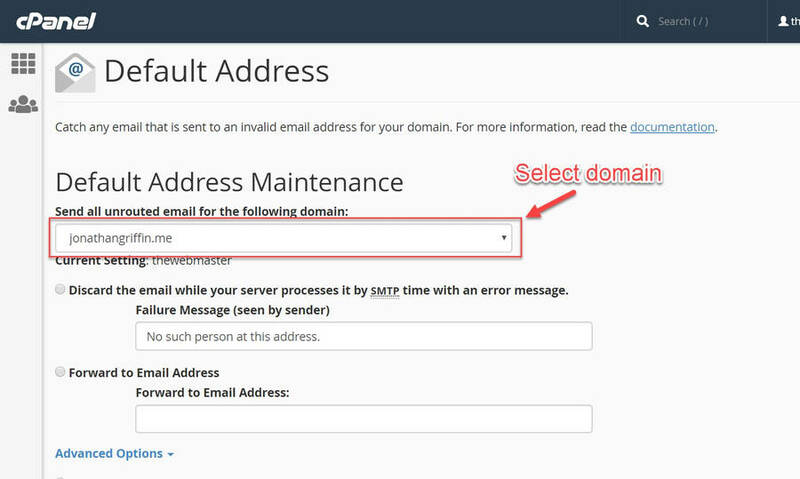 Select the domain on your cPanel account you wish to configure unrouted emails © The Webmaster. You can set any email to be your cPanel default catch-all address. It doesn’t need to be an address created on the same cPanel account. Add the email address that you wish to be used as your default one. Click “Change” at the bottom of the page to save your changes. Select 'Forward to Email Address' and Add Your Chosen Email © The Webmaster. You will then see an acknowledgment that your catch-all email account has been successfully changed. Your default email account is now set up © The Webmaster. Discard the email while your server processes it by SMTP time with an error message. — This option allows you to discard all emails to incorrect or nonexistent email addresses while sending back a message to the sender warning that it has not been received. Forward to your system account - Each cPanel account has a system email account. If no default email address has been configured, all your invalid mails will end up there. The easiest way to access these mails is via webmail. Pipe to a Program — You can choose to pipe the emails to a program. A typical use case is to pipe customer support emails into a ticketing system. Discard (Not Recommended) — You can choose to discard the mails. This may be useful if you receive a lot of spam to random email addresses or old email address that has since been deleted. I cannot see the option to create a default address in cPanel? This is most likely because it has not been configured in WHM. If you are on shared hosting, you should contact your provider and ask them to enable default addresses. If you have Reseller Hosting, VPS, Cloud, or Dedicated, you can enable the Default Address Manager in WHM. You will find this under the Feature Manager’s default feature list.